A happy new year from Sumy Designs to all the small business near and far. 2017 was a good year for Sumy Designs, I hope it was for you as well. We are growing more and more every year and to keep up with all of that growth there is a lot of learning. We learned a long time ago the importance of blogging for small businesses. In fact, we’ve blogged so much about blogging that we could probably write a book on the importance of blogging for small business. 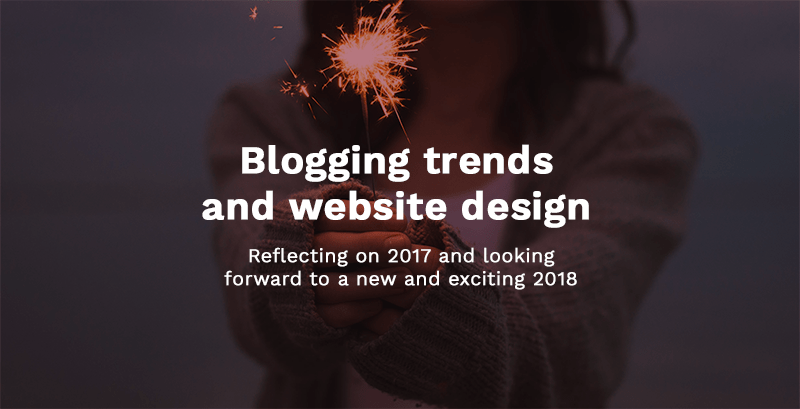 As I was working on my blog post about website design trends for 2018 I was curious to see how Sumy Designs blogging trends and website design measured up to what the design world is predicting for website design popularity in 2018. Blogging has been and remains a pivotal part of our marketing, our success as a small business, and as a vital means of communication with our clients and future clients. 2018 will be an exciting year for website design and it turns out that our top blog posts were pretty in line with what is predicting to trend. If you would have asked me several years ago the things that could happen on Twitter and Facebook I would never have predicted 2017. Wow, what a year for social media. All the hoopla has driven a need for people to do their part to make the world a better place. Several of the top blogging trends for 2017 were highly focused on social media. Not only will you be seeing socially responsible photography on websites and social media venues, you’ll see that users are updating their social media accounts to reflect their personal morals and obligations for the world to see. Facebook and Twitter both have specific sizes for formatting header and profile images and we had the specs ready. If you are a blogger then you more than likely push your posts to your social media accounts. It’s good marketing and good it increases blog traffic. If you optimize your blog posts specifically for your social media accounts you’ll have even better results and have control over the featured image and title display so you will get more click-throughs. Your links will look better and you’ll notice a difference in your target audiences too. Everyone wants to be on page one of their search results in Google. It doesn’t happen overnight and it doesn’t happen by magic. Finding your way to page one takes time and skill. Search engine optimization is something we specialize in at Sumy Designs and it is no surprise that the top blog posts of 2017 include several about search engine optimization. Dominating search results and how to deal with multiple domains and SEO. Fonts have made huge leaps since the beginning of web design and their progress is amazing. Only a few years ago we were limited to what the industry called “web safe fonts” but the future has brought a world of every kind of imaginable online friendly font to choose from. For fonts, the top blog posts for 2017 were about our favorite Adobe Typekit fonts and Google fonts. Typekit fonts are great because you can easily integrate them with your Adobe software and select them from your sidebar during your design process. Google fonts work similarly with the right plugins and they are 100% free and work well in all browsers. And I shouldn’t leave out variable fonts, which are going to gain in popularity from here on out. Didot URW – Didot is a timeless serif that works great for headlines. Park Lane Italic – A simple, but yet beautiful serif font that is a great font for quotes or testimonials on websites. Henderson Sans – This font is bold and is an attention grabber, don’t let its simplicity fool you. Ethocentric – I was surprised at how much I could use this modern looking font. Ethocentric is a medium weight, all-caps font that works great for situations when you need to grab the viewers attention but don’t want to add too much weight to your design. Brandon Grotesque Thin – A go-to font for many designers and a sans serif crowd-pleaser, I couldn’t leave Brandon off the list. Work Sans – Work Sans is a sans-serif font that comes in a variety of widths. This font is easy to read and we loved it so much we used it on our own website. Flamenco – A semi-slab serif, a bit edgy, a bit retro, and easy to read all the way around. Gravitas One – This is a great big, bold and chunky serif font. If you are looking for a statement, Gravitas One is your answer. Roboto – Roboto comes in a variety of styles but this sans serif is a staple for me. If I’m ever at a loss as to which sans serif to use, Roboto never lets me down. WordPress is the most popular content management in the world and so it is predictable that there will be a few people who need some step-by-step instructions on how to do some routine, and not so routine, maintenance every now and then. The top blog posts of 2017 in this category were about how to fix the Display Widget plugin and how to update the WordPress navigation menu. Sometimes the internet is haunted by some pretty slimy and malicious people. There were over 200,000 active users of the Display Widget plugin when in September of 2017 when a company purchased the plugin and corrupted it. The days of having a website and forgetting about it are long gone and if you have a site on the internet then you need maintenance. You can read more about the plugin here. Luckily, you have the great technical support team of Sumy Designs to save the day. Whether there is a problem with your site or you simply need help with your navigation Sumy Designs will always be there for you. Comparing our blogging trends in website design and relating them to the predicted design trends was an interesting project. I hope that 2018 is full of growth and opportunity for your business.